Ever since we got here, we've had problems being understood by Indians. The expression 'lost in translation' doesn't come remotely near what we've experienced. Hands up - we haven't exactly made a massive effort (or even a miniature effort) to learn the lingo, so perhaps we only have ourselves to blame. And you may think I am referring to communications with speakers of Hindi, but I am actually talking about conversing with English speaking Indians - because Indian English is really like a whole other language. And I guess that's why it's called Hinglish. The differing pronunciations; the em-PHAS-is on the wrong syll-AB-les; the rolled Rs...the ability to somehow roll Hs; the speed with which the language is spoken; and of course the infamous head-wobble (first time mentioned on this blog!) 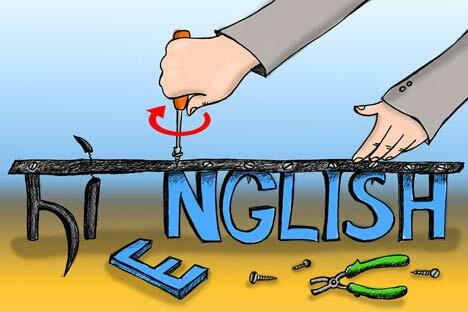 If I was to take you through all of the differences between Queen's English and Indian English, we'd be here all day. It's pretty much the same every time we order a takeaway over the phone. It takes a good ten minutes to complete the ordering process. And that's just for the food. It takes another painful ten minutes to go through our address details! You see, the way he should have pronounced 'roti'...is rrrrrrr-O-ti - with a rrrrrrolled R, the emphasis on the O, ending with an inflected 'ti'. Indian pronunciation is like a workout for the tongue. And if you don't get it right - no one is going to easily understand you, especially if they are less well educated. So I have partially wised up to this with the help of a friend, who once came over to our flat and later ordered a takeaway - her treat. She told me that the secret to successful ordering, is to use your best Indian accent. Now it might sound like you are taking the mickey - and no-one wants to offend anyone - but I have tried it and it WORKS! And if you can do the head-wobble it helps even more (even on the phone!). So in the event of not being able to speak Hindi, I now try and pronounce things with an Indian accent along with a bit of a head-wobble. With this approach, I have found a degree of success in communicating with rickshaw and taxi drivers, market-stallholders and waiters etc. Much to the bemusement of Mr Jules of course. Matters are further complicated by the different languages that are spoken within India - of which there are several hundred mother tongues. In Mumbai, we most commonly come across Hindi (the 'official' language of India), Marathi (Maharashtra), Gujurati, Konkani (Goa/Kerala), Tamil and Bengali. All of these speakers will have their own distinct method of English pronunciation. I could go into a whole long etymological explanation and linguistic history of India, but I don't do blogs that long. To cut a long story short, just when you think you've got it right with a Hindi speaker, a person with another mother tongue may still not have a clue what you're trying to say. The word 'sev' for example (of the dish 'sev' puri) is pronounced SHEW by some, SEW by others, and SAVE or SHAVE by a minority. What's more, Ds are often interchangeable with Rs (Tadka would be Tarka in England) and as with the German language, Vs are interchangeable with Ws. Its wery wery confusing. And those two examples are only the tip of the iceberg! Let's (not) call the whole thing off! Burst out laughing when I read this, I've been in Mumbai for 6 weeks so far and I know exactly what you mean - at work I've resorted to letting others order lunch for me, and I am frequently stuck trying to work out other ways of saying things that might be understood, or compromising completely. Wow! I wrote something about this topic once or twice at my blog, but you have written it far better and more accurately. One of these days, I hope to collect all the differences in the pronunciation of English by Indians and Westerners (e.g., Americans, Canadians, British). Here, I just want to provide a recent example. I think that part of the problem (for me, at least) is that Indians use British English. I am aware of that and am knowledgeable of all (I thought) differences. One evening, my wife and I were in a restaurant admiring all the different dishes laid out on the table in front of us. She referred to it as a BUHF-it. I "corrected" her and said that it was a buh-FEY. Just now, I went to dictionary.com and saw that her way of pronunciation was the accepted British way of speaking. In this respect, I think that both of us were correct. Hi Mickey. Indians may well use British English (as we will have introduced the language) however the pronunciations and the accent is completely individual to India/Indian mother tongue speakers. A lot of it has to do with the fact that some English vowels and consonants simply do not exist in the Hindi alphabet (or other Indian mother tongue) and so the pronunciation can only be approximate. The way the mouth is formed is completely different for some Indian English speakers. And the way the British pronounce Buffet - is Buff-AY - as it is actually a French word. These days, I am sure that American TV is having a huge influence on Indian-English accents. I have already noticed it.